As well as several galleries of illustrations and several one-page comic strips. *The concept art pinup of the Triceraton was originally published in Gobbledygook (Vol. 1) #1. *"Don't Sleep on Main Street" and "Only a Loser" were originally published in Gobbledygook (Vol. 1) #2. The original two-issue Gobbledygook (Vol. 1) series was Eastman and Laird’s first published collaboration and was printed essentially on Xerox paper and limited to print runs of 150 each, making them very easily counterfeited. The original Gobbledygook series contained no TMNT content to speak of, outside of a single advertisement for TMNT (Vol. 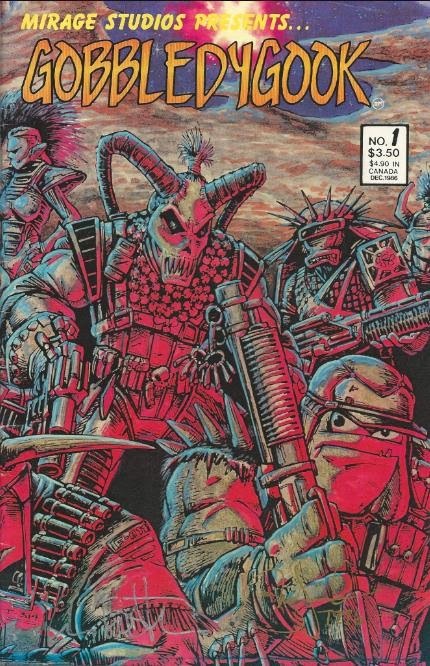 1) #1 printed on the back cover (which many comic book price guides to this day continue to misinterpret as the TMNT’s first appearance) and the first twenty pages of Fugitoid (microseries) #1 segmented into four chapters. This Gobbledygook (Vol. 2) #1 one-shot is a celebration of Kevin Eastman and Peter Laird’s career, collecting stories from the first two-issue Gobbledygook (Vol. 1) miniseries, original material, rare illustrations of both the published and unpublished variety and some guest material. I have a copy of the book signed by both Eastman and Laird. Very similar to the cover you have posted up here. A signed copy of Gobbledygook was sent to all Mirage Publishing Fan Club members in fall of 1994. I was in the 4th grade and had totally immersed myself into the Mirage Publishing universe. I remember getting the book in the mail and treasuring it. I still have it and it is still in immaculate shape after all these years.